As the state of Utah’s designated public liberal arts and sciences university, Southern Utah University stands apart in service, with a more personalized and comprehensive education than may be possible at many other institutions. In recognition of SUU’s distinct value, the Council of Public Liberal Arts Colleges (COPLAC) recently cast a unanimous vote to accept the Cedar City university for COPLAC membership, making SUU its 27th member institution. 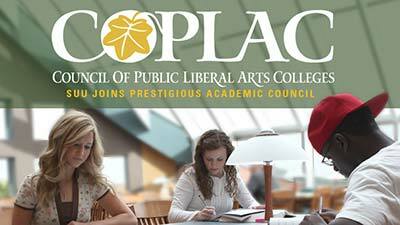 For its members, COPLAC works diligently to advocate for the comprehensive liberal arts and sciences academic experience among state and federal policy makers as well as major national higher education organizations. Additionally, COPLAC facilitates collaborative learning and exchanges between member institutions—a great benefit to each school’s students and faculty as they share information and advance respective fields of study. The COPLAC central office and staff are located on the campus of the University of North Carolina, Asheville. The staff works actively with member institutions to improve the quality of liberal arts and sciences education on each campus. For additional information or inquiries concerning membership, please contact Director Bill Spellman at 828-350-4590 or Program Associate Sarah Olivo at 828-258-7879.